Monica Haller worked with a friend who’d been deployed to Abu Ghraib as a nurse to create a book-project offering first-person photographic perspectives on the current war. Haller, the healer-soldier Riley (a college friend of Haller’s), and a graphic designer formed a collaboration resulting in the book Untitled (Riley’s War Images). A mock-up of the book, one of two displayed at Minneapolis College of Art and Design as part of a Jerome Foundation visual arts fellowship recipients exhibition, was acquired by the International Center of Photography in New York. The photographs in the book were made by Riley during his tour, and they include both gun-sight points-of-view, like the scene above, and images in the mobile surgical units, interspersed with commentary about photography and personal experience in war. Of note in this vein, too, is Lori Grinker’s amazing work in the AFTERWAR project. 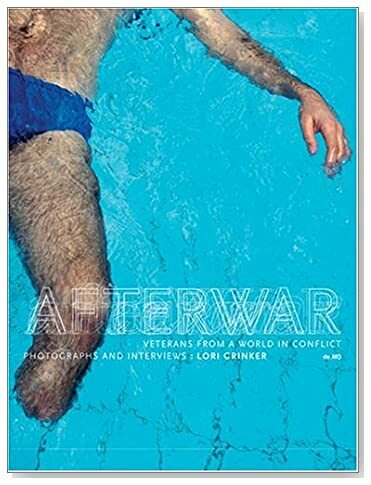 Published as a book (above) in 2005 by de.MO, the photographs present an astounding range of war’s survivors, alongside interviews that explain the personal impact of war on soldiers. The sheer number of global conflicts represented (the earliest is World War I) is sobering testament to the unconscionable reality of our tendency toward violence as a means of resolving differences. Sadly, this is a series of photographs that will never end. I have been a fan of Grinker's work for a long time. I recently just picked up on Haller's book too. I have some more thoughts about the influx of vernacular conflict photography, and the notion of 'Photography as an Act of Deployment'.http://prisonphotography.wordpress.com/2010/02/12/riley-and-his-story-abu-ghraib-hospital/I think Haller and Riley have put together an incredibly meaningful book.